Posted by randydeutsch in architect, collaboration, identity, IPD, questions. Shortlisted for a major project on the west coast, I’m going into a project interview in a couple days. With little interest in giving a dog and pony show, I want the meeting to be a working session. To give them a taste of how we – as a team – are to work with. And to make good use of everybody’s time. Get some real value out of our brief time together, whatever the results. We’re not going to pretend we have all the answers. So we’ll ask a lot of questions. And answer some of their questions with questions of our own. But to engage the client in a dialogue. Participatory design is a design approach that seeks to actively involve all stakeholders (employees, partners, customers, citizens, end users) in the design process to help assure that what is designed meets their needs and functions well for all. It involves cooperation and collaboration, and the attitudes and mindset necessary to allow these practices to flower. Prior to its popularity in the 60’s and 70’s, participatory design was known as Cooperative Design. Now we have Crowdsourcing and Integrated Design. And would you know it, Co-Creation, too. In The Power of Co-Creation: Build It with Them to Boost Growth, Productivity, and Profits, authors Venkat Ramaswamy and Francis Gouillart explain how to tap into ideas, design and build products and services by engaging directly with employees, stakeholders, clients and suppliers. The applications to, and implications for, Integrated Project Delivery (IPD) – especially in terms of how co-creation can help to lower risks and costs – are readily apparent. And like IPD it involves a democratization and decentralization of value creation among other benefits. 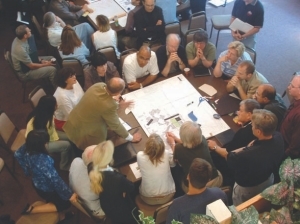 Participatory design is a far more democratic approach to design than most architects today would be comfortable with. It’s one that requires relinquishing control of the very design process that the architect struggles with to lead. The American architect Charles Moore – a successful proponent of participatory design – had flippantly said that, in his own case, his oversized ego allowed him to relinquish his reigns on design. This is an accurate statement in that Moore alone among architects at the time (1980’s) had the self-awareness and self-belief – the confidence – that he could take any form the masses came up with and turn it into an exceptional work of architecture. And he was almost always right. Plain Modern: The Architecture of Brian Mackay-Lyons presents the work of Charles Moore’s internationally acclaimed, California-based firm Moore Ruble Yudell, whose unique expertise in community involvement and participatory design has profoundly influenced the course of contemporary architecture. Moore’s advocacy of user participation in the design process influenced a whole generation of designers. One of these was Brian MacKay-Lyons of MacKay-Lyons, whose mentor was Charles Moore. But in changing names of this powerful design process over the years have we inadvertently thrown the baby out with the bath water? Today we may talk about building social ecosystems, designing engagement platforms and expanding scope and scale of network interactions, but what we really mean when we say transforming enterprise operations through co-creation is…participatory design. Whatever name you give it, participatory design is fast replacing traditional thinking that viewed design innovation as a proprietary activity. Architects, upon being asked a design or building question, can no longer say let me go back to the office and study it. Because it’s all integrated and participatory from here on out. Today we have science in the open, theater in the open, “out in the open” with CNN’s Rick Sanchez. But design in the open? To succeed, get buy-in and move projects forward, architects and other design professionals will need to design in the open. Guy Horton: In your opinion, can architects reclaim more of a public role? This is something that is discussed in professional circles. There is the perception that they are more insular and out of the loop and have ceded much of their power to developers. What can architects do to elevate the visibility of their role? Witold Rybczynski: I just watched an interview with Charles Moore on YouTube. He was talking about how architects should listen to the public, rather than dictate to it. It was quite compelling. That was in the 1980s, and neither postmodernism nor Moore’s vision of participatory design caught on. Not many architects had Moore’s confidence to share design decisions with their clients. Moreover, architects tend to be persuaders rather than listeners. Success in the architectural profession–realizing one’s vision in something as large and complex as a building–requires a strong ego and a single-minded, almost obsessive, attention to detail. These qualities can easily turn to arrogance. It is, as the French say, a déformation professionelle. If the result is an increase in participatory design, here’s to a déformation professionelle in 2011. And read this book: one of the best books ever written on the subject for those who want to encourage full participation in their own work, universally esteemed and revered,the Facilitator’s Guide to Participatory Decision-Making by Sam Kaner et al. Highly recommended. Collaborative design is very hard to bill for. Just being practical — architects can quote fees because they assume a certain number of hours of nattering by their clients. When you enlarge the nattering quota to “infinity” you have to either be very omniscent about the decision process or have an hourly fee, or have really really done this a lot and be able to make a pretty good guess about how long the whole thing will take. There is of course value to the collaboration. But there is also value to the specialized knowledge that a design professional brings to the table. Not because they are “designers” but because they have done this a lot of times. Doing something a lot of times brings a perspective and judgement to the process that almost no community member brings to the table. Its the “I’ve done this 100 times” that is valuable to the community and the owner. Often Architects seem superior and dismissive as they go about their “design process” because the have solved so many comparable problems that the answer seems intuitive. We know the bad parts of that — the “I know better than you” attitude that often hides behind a black sweater and jacket and the “don’t bother me with details” attitude that hides behind a closed door. But often — this also effaces itself in a quiet sigh that starts a long educational conversation along the lines of: “yes, but did you think about this? and what about this option? and you know, if you do this, then this is an issue.” For many of us who put projects together in our heads, we went through long, horrible work days in our 30’s as we learned how things worked and didn’t work and now the connections are almost too fast to list about how projects and buildings work. I often tell clients that what they are paying me for isn’t a product — its my judgement about a project. That’s the undefinable thing that sort of gets reflected in billing rate. The best of us make that whole intuitive process look impossibly easy — but even Fred Astaire had to practice every day. Thanks Anne for sharing your thoughts and ideas. I always learn so much from you. One of the great ironies, for me at least, is that those who practice participatory design both need a strong ego and sense of self to have the confidence to be given half-baked suggestions and turn them into a viable, workable and hopefully exceptional building – while at the same time – need to be humble enough to encourage everyone’s input and treat participants as equals. I have seen Michael Pyatok and Charles Moore do this to remarkable results and perhaps a small handful of others. It’s a rare talent but one that I still believe we can learn from and in certain cases, apply. I was educated in a system that encouraged collaboration. My undergraduate college emphasized Bauhaus inspired interdisciplinary collaboration among creatives. My graduate school mentor was Donlyn Lyndon, a protege of Charles Moore and a principal in MLTW, who emphasized collaboration as participatory design. Collaboration is an essential core value of my office’s design process. We incorporate a form of participatory design with our clients very early in the design process and collaborate with other creatives necessary to the successful completion of the project. Collaboration takes courage no matter the size of the participating group because the architect/designer must suspend preconceptions and judgements while listening deeply to others. Most of our projects are commercial/private and the number of participates is smaller than would occur on public projects, but a strong sense of confidence is essential to leading the sessions. One must not be afraid to ask silly questions of the participants in order to dig deep beneath the surface of discussion. We don’t educate our clients as much as assist with informing them of the technical and legal aspects of a design question. If one is able to empathize with the client group a design solution to the question can be arrived at while addressing the technical/legal issues. This is a very important topic of discussion Randy. Thank you for raising it and good luck with your interview. And as they say on the News Hour this will be continued and we will be following it. Thanks for sharing your insights and experiences, Ted. You were so fortunate to have Donlyn Lyndon as a mentor. Thanks as well for the well-wishes! Our industry is trying to embrace collaboration in lots of ways right now. Your post reminds me of http://www.openingdesign.com which is a website being formed where architects (and other building professionals) can come together and share resources. It’s based on an ethos of open source. But the first reply, about how difficult it is to bill for such a messy/uncontrollable design process is something I’m very interested in hearing how you overcome that. If you get this job, please consider sharing how you put together your fee structure. Thanks Oscia for the link. Opening Design in fact, despite not being a follower, retweeted my tweet for this post and I didn’t bother to see who they were or what they were about. My bad. I will do that now. I have found the participatory process time consuming but chalk it up to doing business and getting our message – and hopefully work – out into the world. Clients don’t like to be nickled-and-dimed so we’re not about to propose billing on 15 minute increments like attorneys. Like any good practice, we try to anticipate how many meetings and follow-ups, provide an upset limit with the understanding if we go beyond we have the chance to renegotiate or provide as an additional service. My best experience has been to not charge for this additional time – but to keep track of the hours nonetheless. Later, when there’s the inevitable discussion about additional fees or some site issue or supposed oversight, we can pull out a sheet indicating how much “free” work we provided early on. That usually puts an end to any ill-feelings on their part. Happy to share how we structured our proposal and fees. Hope to have the opportunity to do that. Thanks for the interest and for asking. Our industry is trying to embrace collaboration in lots of ways right now. Your post reminds me of http://www.openingdesign.com which is a website being formed where architects (and other building professionals) can come together and share resources. It’s based on an ethos of open source. But the first reply, about how difficult it is to bill for such a messy/uncontrollable design process is something I’m very interested in hearing how you overcome that. If you get this job, please consider sharing how you put together your fee structure.